Mark your calendars! The 2019 Agricultural Trades Show will be held at the Augusta Civic Center on January 15th - 17th, 2019. What's Happening at the Show! The State of Maine Agricultural Trades Show takes place every January and serves as a source for agricultural resources and products. Producers and consumers alike visit this three day show to take stock of current programs, new technologies and to gather information on the agriculture industry. This show is sponsored by the Maine Department of Agriculture, Conservation and Forestry and provides promotion opportunities for businesses and organizations on the trade show floor, but also houses various lectures, certification courses and annual meetings throughout its duration. The event has activities geared towards promoting industry collaboration and progress. What's Happening at the Ag Trades Show! Download and print a PDF of the most current schedule for workshops, presentations and meetings at the 2019 Ag Trades Show. Subscribe to the news alerts for updates. Be sure to check the event schedules at the show for any final updates. Note: Times and rooms subject to change. Please check schedule at the venue. 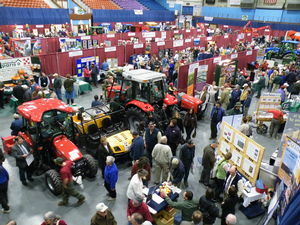 The Ag Trades Show takes place at Augusta Civic Center, 76 Community Drive, Augusta, ME 04330. 1/9/19 - Agricultural Trades Show Highlights Growing Maine Agriculture! Applications for the 2019 are not open at this time. Please sign up to receive event updates and follow our get real. get Maine! social media accounts to stay connected! Those who sell and provide goods and services to agricultural based-businesses. What types of meetings occur? The Ag Trades Show aims to provide a venue for information for attendees to learn more about best practices for all aspects of sustaining their agricultural business. Meetings should be relevant to this topic so as to provide value, instill cross-promotion and knowledge sharing for Maine’s diverse agricultural economy. The Ag Trades Show is an opportunity for members of the public to learn more about the role and value of agriculture, and its importance to rural communities and the state of Maine as a whole. In addition to meetings and exhibits, there are demonstrations and workshops, and a producer and product showcase, which is an opportunity to purchase Maine food, goods and provisions. We hope you will join us to network and support Maine agriculture! The event is open to the public. We encourage the public to download the annual event, which is published in the end of November, beginning of December each year. Deadlines for future shows will be posted here. Get Agricultural Trades Show News!